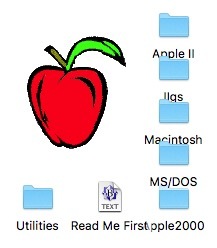 user group and the BBS, a large number of files for both the Apple II series, and the Macintosh, were collected. These archive disks includes all the files that were held in the Bulletin Board libraries, as well as the complete collection of Apple II disks from the Apple2000 library. Available as an HFS or UDF disk image.